The east fork of the Wallowa River begins at a crystalline, snowmelt lake, high in the rugged mountains of the Eagle Cap Wilderness area. 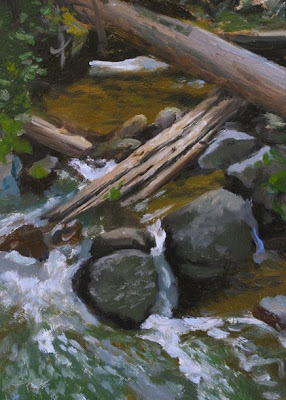 Icy waters tumble and pool their way down the steep-sided canyon, splashing over and around granite boulders and deadfall timber. The sound is pure music. the painting is wonderful.... the description just took me there. r.
Much appreciated, Rahina. I'm enjoying your recent portraits. So simple and dynamic. Great composition and brushwork! Outstanding work you've been painting! I had to check and see where these spots are you've portrayed. Some look very much like north Idaho! Hi Cooper, great to hear from you. Thanks a lot! Thanks Artpencil and welcome to my blog.